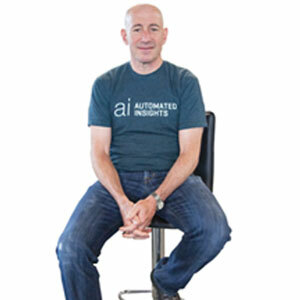 “The old-fashioned storytelling through the written word is the most reliable way to make sense of data in the future.” This exposition by Marc Zionts, CEO of Automated Insights, deems valid for today’s post-digital business world that is significantly overwhelmed by the deluge of data. As the business intelligence (BI) industry proliferates to create more sophisticated BI tools and dashboards to deliver actionable intelligence to organizations, a significant part of the enterprise sector still fails to process or interpret the actual information intended by the analyst who created the dashboard. In fact, according to Gartner, only 32 percent of an enterprise workforce on an average can comprehend a dashboard or the visualization with the right meaning that the analyst wanted to convey. The intricate visual representations require simplification by footnotes and explanations from their creators to convey a thorough story. Not only does it take a considerable amount of time to understand all the correlations and interdependencies between different charts of the dashboards but there’s also a huge risk of broadly sharing wrong or incomplete information across the enterprise structure. Automated Insights addresses this complexity with plain-language narrative reports for deriving clear, personalized, and timely business insights. Automated Insights’ Wordsmith is a broad and horizontal business tool that spans across 50 different industry verticals with a predominant focus on business intelligence, financial services, insurance, ecommerce, and sports industries. The company publishes in multiple languages and has enabled its customers to create use cases in 25 different languages. “Unlike other industry providers, our product is flexible and open to customization through the self-service offering and role-based, written analytics it provides. Those aspects, along with our ability to offer more than one or two languages, are what constitute real differentiators for us,” adds Zionts. As the first natural language generation tool in the market, Automated Insights’ Wordsmith has a tremendous competitive edge, evolving as a part of a large corporate structure of Vista Equity Partners. Listing out the company’s recent ventures in 2017, Zionts mentions Automated Insights’ integrations and partnerships with a number of BI platforms and firms where the company started working with system integrators to facilitate effortless implementations of its solutions. Strengthening their stronghold in North Carolina, Automated Insights continues to expand their partner network and plans to extend its presence from the current three locations across the southwest, midwest, and northeast to eight more locations in 2018.